MELAG steam sterilizers and autoclaves for practice and clinic combine reliability with innovation. More than 500.000 purchases of MELAG autoclaves worldwide prove the success of our quality products – made in Germany and competence in hygiene. Automatic cleaning and disinfection with MELAtherm 10: Increase the efficiency of your instrument decontamination process. The innovative washer-disinfector saves time and money. Reliable packaging is the pre-condition for long-term instrument sterility. MELAG sealing devices guarantee a secure seal seam and thereby providing the best-possible protection against recontamination. Generating demineralized water in your practice and clinic: Save money by supplying steam sterilizers and washer-disinfectors with high-quality demineralized water from our water treatment units of the MELAdem series. Legally-compliant documentation of the instrument reprocessing procedure: Documentation, approval and traceability with the software solution MELAtrace. Learn more about our products for documentation and batch approval. Protect the instruments from recontamination: Package and store instruments in our sterilization pouches MELAfol or in our wash trays and sterilization containers of the MELAstore System. The Disinfectants of MELAdes for hand, surface and instrument disinfection: A hygiene system with four reliable products for practice and clinic. Strong against microorganisms and bacteria whilst protecting surfaces and skin. What is the instrument reprocessing cycle? Instrument reprocessing is a physical or chemical procedure to decontaminate re-usable medical devices for further use on patients and handling by staff. The aim is to protect patients and practice staff from harmful microorganisms on the instruments. The complete instrument decontamination process consists of cleaning and disinfection, inspection, packaging, sterilization as well as documentation and approval. International guidelines state that the entire process of instrument reprocessing needs to be performed by trained personnel using monitored procedures to ensure reproducibility. These requirements contribute to the health and safety of patients, users and third persons. Practice and clinic personnel responsible for instrument decontamination must be equipped with personal protective equipment (PPE). In accordance with international standards, the PPE consists of a mask covering the nose and face, protective goggles, protective gloves and a moisture-repellent apron. The use of aligned products from a single manufacturer ensures efficient and safe workflows. The decontamination process in a medical and dental practice must be defined in the hygiene plan and standard operating procedures (SOP’s). Detailed standard operating procedures (SOP’s) ensure that re-usable instruments and medical devices are successfully decontaminated by practice staff. Management system is conducted to control all steps of the decontamination cycle. Appropriate decontamination areas are provided. Appropriate equipment is deployed: Please be aware of the proper maintenance and operation according to the manufacturer's specifications. Practice Staff are properly trained and supervised. Single use medical devices and instruments are not reused. Records and log files of instrument reprocessing are stored. Learn more on each single step of the instrument decontamination cycle: The entire workflow of instrument decontamination comprises preparation, cleaning, disinfection, inspection, packaging, sterilization, documentation, approval and storage of the medical devices and instruments. Correct preparation of instruments comprises the collection, pre-cleaning and if necessary, the dismantling of the instruments and their quick transport from the treatment room to the decontamination area. To minimize the infection risk, the used instruments and medical devices must be placed in closed containers and transported to the decontamination area for reprocessing as soon as possible. Pre-Cleaning includes the removal of coarse soiling and water-insoluble residues on the instruments. ✓ You can collect the instruments in an instrument bath without using disinfectants or water. ✓ Health and safety considerations require that the instruments must be transported to the decontamination area in a closed container or instrument pan. To prevent blood, body fluids, and other contaminants from drying on the surfaces, surgical instruments should be transported immediately to the decontamination area. ✓ Pre-clean the instruments with plastic brushes to protect the instrument surfaces. Ultrasonic devices with MELAdes 800 and MELAdes 801 can additionally help remove soiling. Compared to the manual cleaning and disinfection, the instrument decontamination in a washer-disinfector is especially time and cost-effective. Automatic reprocessing in a washer-disinfector subjects the instruments to alkaline cleaning and thermal disinfection. ✓ Soaking the instruments in a washing and disinfectant solution immediately before automatic decontamination is not mandatory, but it is common practice. In order to prevent foam generation in the chamber of the thermal disinfector, please rinse off instruments beforehand to remove cleaning fluids and disinfectant residue. ✓ To prevent protein coagulation, instruments should be reprocessed in the washer-disinfector within 6 hours after use. ✓ The hollow bodies of instruments (e.g. ultrasonic scaler tips, hand pieces, turbines or endoscopes) are cleaned and disinfected by using appropriate adapters on the injector rail of the MELAG thermal disinfectors. The electronic system of the washer-disinfector ensures that all the required parameters for automatic decontamination are fulfilled. After successful cleaning, disinfection and drying, trained personnel additionally need to perform a visual and functional check of the instruments. Some of the instruments require the use of care products. To do so, please follow the specific manufacturer's recommendations. ✓ Remove damaged instruments or instruments with altered surfaces at once. ✓ Please use sterilizable and steam permeable oil to prepare hinged instruments and other moving parts in accordance with the manufacturer's specifications for the sterilization. Before instruments can be sterilized in an autoclave they must be suitably wrapped, either sealed in a transparent sterilization package using a sealing device or simply as a set in a sterilization container. Please perform this process step in a clean and low contamination area using approved products e.g. wrappers, pouches, containers. International hygiene guidelines require routine tests such as the seal seam stability test or the seal check for sealing devices. ✓ The use of protective caps on pointed instruments prevents damage of the sterilization packaging. ✓ Hinged instruments must be opened slightly for proper sterilization. ✓ Sterilization pouches should only be filled up to 75 % capacity and should not exceed a maximum weight of 3 kg per package. Instruments should be sterilized with saturated steam. Hence, medical and dental practices or clinics usually use steam sterilizers. The international standard DIN EN ISO 13060 divides steam sterilizers into the classes B, S and N. Class B autoclaves have the advantage that the instruments can be sterilized independently of their packaging type and the complexity of their hollow bodies. Class B represents the highest sterilization standard. ✓ Place the sealed pouches on the tray with the paper side facing downwards. ✓ Do not place multiple pouches on top of each other on a tray or in a container. ✓ When loading, ensure that textiles and foil packages are placed on a tray at the top of the sterilization chamber; unwrapped and heavy instruments need to be placed at the bottom of the sterilization chamber. The instrument decontamination process is completed by a batch approval. This must be performed and documented by authorized personnel. Current legislation requires proof that instrument reprocessing has been performed correctly. Complete documentation ensures legal certainty and reliable traceability of the instruments to the patient. ✓ Store all instrument reprocessing documentation for a minimum of 5 years. To avoid liability risks, we recommend that records should be stored for 30 years. ✓ In view of these long record retention periods, we recommend that you save all documentation on digital data carriers. ✓ To ensure complete traceability, please transfer the label or batch number to the patient record after using the instrument. Sterile instruments must not be recontaminated during transport and storage. Therefore, the sterilized instruments are safely wrapped to prevent recontamination. The instruments must be stored at room temperature in a clean and dry location, protected from dust. Please handle the packs carefully to prevent damage and loss of sterility. ✓ Given the maintenance of the prescribed conditions, we recommend that single wrapped instruments shall not stored for more than six months. Please comply with the regulations of regional authorities. ✓ Some countries stipulate that sterilized instruments cannot be stored in the decontamination room. Acquaint yourself with the respective regional requirements. ✓ Seals around the doors of instrument storage cupboards protect the sterilized instruments from dust and external influences. A structured decontamination room is the basis for the best-possible protection against infection. When planning a decontamination room, it is important that the clean and dirty zones are separated. The dirty zone comprises the delivery area, the washer-disinfector and a workstation for the manual preparation or decontamination. A control area for the unloading of the washer-disinfector, the performing of functional checks and sorting the instruments is located in the clean zone. The sealing device, steam sterilizer and documentation medium are located in the clean zone as well. The set-up of the devices must align with the order of the instrument decontamination workflow. The clean and dirty zone can be marked by a colour coding on the wall or furniture surfaces: Red for the dirty area and green for the clean area. The correct equipment of the decontamination room enables you to optimize processes and increase the safety of patients and practice team alike. An optimized workflow also saves time and money along the entire instrument reprocessing procedure. As a result, we recommend using devices from a single manufacturer wherever possible. What are the advantages of instrument reprocessing using the MELAG system solution? International hygiene guidelines recommend that instruments should be reprocessed using aligned procedures. As such, a washer-disinfector must be capable of cleaning, disinfecting and drying instruments in a way that the subsequent packaging and sterilization do not cause any damage e.g. through corrosion. One of the advantages of the innovative MELAG system solution for instrument decontamination includes the maintenance and service cost saving. Purchasing a steam sterilizer, washer-disinfector, sealing device and water treatment unit from the same manufacturer means that a practice and clinic can ensure the alignment of the various procedures. Using the services of MELAG-trained partners, the system guarantees synchronization of the maintenance cycles. A further advantage of the system solution results from the use of the documentation and approval software MELAtrace. In contrast to the majority of other software products, you will not require additional separate licenses for each product. Reliable documentation of the complete instrument reprocessing cycle is possible with a single, affordable software without annual license costs. Disinfection and sterilization are important aspects of the instrument reprocessing procedure: These processes perform a different degree of microorganism destruction. Whilst disinfection reduces the number of microorganisms by a factor of 100.000, sterilization achieves a factor of 1.000.000. Disinfection is also classified as the irreversible deactivation of all contagious pathogens (fungi, bacteria and viruses). Instrument sterilization is required to kill off the resistant dormant bodies of pathogens such as spores. Sterilization results in the destruction of all microorganisms that are capable of reproduction and leads to a complete absence of germs. What are the advantages of using a wash tray system such as MELAstore? Although wash tray systems have only been taken up by large-scale medical and dental practices with a high rate of instrument usage. Small and medium-sized practices and clinics could also benefit from a wash tray system. Collecting the instruments in a wash tray saves a number of work steps. In comparison to the time-consuming action of placing individual instruments in washer-disinfector baskets, the wash tray can be inserted in the appropriate mount and removed after cleaning, disinfection and drying in only one step. Nevertheless, the greatest saving of time and money is achieved in the packaging process. Instrument sets in wash trays can be wrapped and quickly prepared for sterilization and storage by using a sterilization container such as MELAstore-Box. The container is marked with a barcode label after sterilization. The decontamination of 36 instruments in three wash trays and sterilization containers saves up to 24 minutes per batch in comparison to the individual decontamination of the same quantity of instruments. See for yourself: The video “Individual Instruments vs. MELAstore” on the MELAG Multimedia Channel summarizes the advantages of using our MELAstore system. The decontamination of standardized instrument sets results in considerable improvement in the quality management of a clinic. The wash tray system reduces the large quantity of practice waste, protects the instruments against damage and prevents injuries to the practice team. The MELAstore system provides a combination of wash trays (MELAstore-Tray) and sterilization containers (MELAstore-Box) which offer all the above advantages. Saving money and time produces short amortization times. A special advantage of the simultaneous use of MELAtherm 10 and its insert baskets: developed for use with the MELAstore system, the insert baskets enable especially sustainable operation and excellent cleaning results. What are the advantages of an app for instrument decontamination? The entire process of instrument decontamination comprises cleaning and disinfection, packaging, sterilization, documentation and approval. Due to this complexity it is possible that the clinic team can lose track here, especially in stressful situations. With the MELAconnect App, you benefit from smart workflows in instrument reprocessing: The app enables you to monitor the device status and program progress from any location in your practice or clinic thus saving valuable time that can be used for the treatment of your patients instead. The integrated Media Center of the MELAconnect App helps you to keep everything under control. 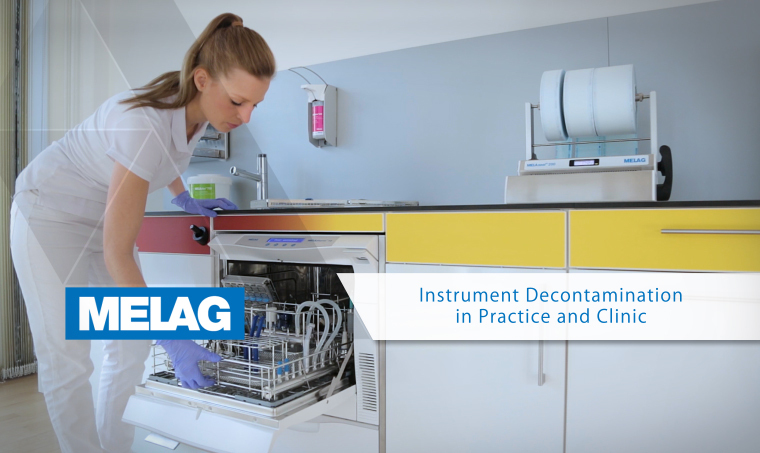 You can access helpful video tutorials on all relevant instrument decontamination issues as well as user manuals of the MELAG devices. And in the unlikely event of a malfunction: The Troubleshooting Tool identifies the warning or error number and gives you advices to resolve the problem. You can also document the routine tests of a sealing device quickly and paperless when using the seal check function. For traceable archiving, simply take a photo of the seal check with your smartphone or tablet. The MELAconnect App then saves the test quickly and easily. Benefit from the full potential of the MELAG system solution and take instrument reprocessing to a whole new level: The MELAconnect App can be run on any smartphone and tablet with the operating systems iOS and Android. Connecting MELAtherm 10 Evolution, the Premium-Class Evolution series and the Cliniclave 45 series to the same clinic network allows you to monitor them conveniently via app. The MELAG system: the best hygiene workflows following European standards and regulations for safe and efficient instrument re-processing. Relying on the MELAG system solution means another great step ahead shifting the instrument reprocessing to the highest level of infection prevention. MELAG products help us to save costly energy and valuable time which results in an accelerated instrument decontamination process.